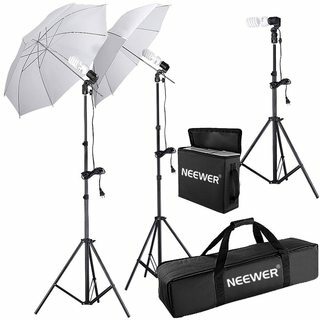 Are these cheap studio continuous lighting kits good for beginners? I want to learn indoor portrait photography and I want to know if the cheap kits on eBay are for beginners, or if they work well at all? Those types of continuous lighting sets work, but aren't great as beginner gear for portrait photography, simply because they lack much power/light output, and the more you have, the bigger the lighting ratios are that you can use. And lighting ratios are how you get that "studio look" with off-camera lighting. In addition, the light stands may not be air-cushioned, and umbrellas or other modifiers may be lower grade and not stand up to hard usage. Being able to turn the background black or white simply by lighting it requires that you be able to make your subject (or background) much brighter than the other. Low-powered CFL continuous bulbs are basically just about as bright as the ambient, and not a lot more. Some kind of strobe/flash lighting is generally going to be more useful, because you can get a lot more power. But it will be harder to learn to visualize, if the flashes don't have modelling lights (small continuous lights that can give you a sense of what the strobe's light will look like in real time without having to take a picture). You may want to consider going Strobist with off-camera speedlights (hotshoe flashes), or using plug-into-the-wall studio strobes, or a combination of the two. Everybody tends to recommend what they like, but if you're willing to take a gamble on low-cost Chinese-made gear, the brand I'd say is worth looking at is Godox. Yongnuo is great, but doesn't work that great as a lighting system. Their three separate radio triggering systems are mostly incompatible with each other, and mixing TTL and manual gear or speedlights and studio strobes can become incredibly difficult. Godox has designed their system of lights and triggers to interoperate together, so upgrading from speedlights to bare bulb flash to studio strobe is relatively easy, and integrating TTL and manual gear is relatively easy. Cybersyncs can only power-control Paul C. Buff strobes. Not speedlights. Yongnuo triggers can only power-control YN speedlights, but not studio strobes (ok, the Yongnuo YN-300W can take a 622C, but...). Godox X1 triggers let you control both Godox strobes, as well as speedlights and probably give you HSS as well as power control--even over Godox's manual flashes in the X1 system. A YN-660 and YN-560-TX costs roughly the same in USD as a Godox TT600 and X1 transmitter. I would not recommend those. If you are taking video, yes, but for portrait still photography is far better-using flashes. 3 tripods their respective heads to attach the flash to the tripod and 2 translucent umbrellas. If you only buy 2 flashes, you still can have a fill light bouncing the main light with a big foam board white panel. The backdrop can be easily replaced with tack on a wall. A starter kit does not mean a bad kit. The "starter" option would be 1 flash, 1 umbrella and the radio trigger (and the big foam board). You can then buy another flash for a more complete kit, and then buy the third one. Then the 4th one for hairlight. 1 single flash can produce dramatic lighting, normally low key photos. Then start building from there. If available in your area, I'd recommend the Visico brand. These aren't super expensive and perfect for casual use, as they have modelling lights and good adjustment for power. They also have a IR receiver allowing a strobe to see another has triggered - thus allowing for one radio receiver. I wouldn't go super cheap as you get what you pay for, nor would I go super expensive unless you plan to do it professionally day in / day out. Suggest something around 400 W/S power, two or three strobes. 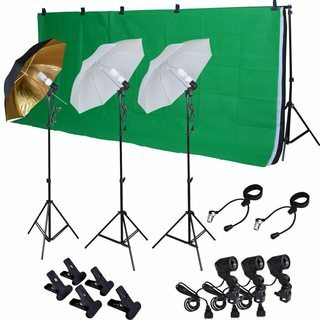 A couple of softboxes (again these don't have to be expensive - mine are about 8yrs old and only cost USD$60 ea. If you want a more constrasty look a beauty dish is great. A foam board is handy as mentioned previously for fill - available from art stores. One recommendation (based on experience) don't go too cheap on the wireless triggers. I did and they were awful - misfires, RF interference etc. You don't need to get fancy TTL versions, just plain manual is fine (though you will need to do a little more setting up of the camera potentially). I personnaly use Cybersyncs and find them awesome (both for indoor and outdoor). Backgrounds - white and black are good starters. Not the answer you're looking for? Browse other questions tagged lighting studio-lighting studio continuous-lighting or ask your own question. Advices for a good studio lighting photography book? How much fluorescent/CFL power do I need? How to photograph subject on white seamless background using continuous lighting without post editing? Can i buy these lights and be able to use them without a plug in?